The desire to contextualize the gospel springs from a desire to make the gospel understandable to all. Done properly, contextualization is the proclamation of the Christian message in a way that people understand it. 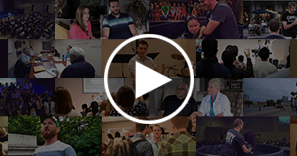 True contextualization occurs when the message of Jesus is made clearer to a listening audience. Sadly, what often passes for contextualization is not a clearer gospel, but a muddier gospel. Not a sharper gospel, but a duller gospel. Not a narrow gospel, but a wide gospel. Not a potent gospel, but an impotent gospel. What passes for contextualization often has more to do with earning the approval of man than proclaiming the gospel approved by God. And that is a gospel-less gospel. The Apostle Paul became “all things to all people” in order to “save some.” So, the contextualizer reasons, “We must become all things to all people,” but the bad type of contextualizer forgets about the “save” and gives no thought to the “some.” What I mean is that the faux contextualizer is a self-proclaimed expert on morphing into each and every cultural zeitgeist and, as such, is more concerned about the approval of most than the salvation of some. To the postmodern he’s a postmodern and denies the existence of truth. So he loses the absolute truth of the gospel, but thinks he wins the approval of the nihilist. To the social justice warrior he’s a social justice warrior and redefines justice. So he opens himself up to pervert the justice of the gospel, but thinks he wins the approval of the SJW. To the feminist he becomes a feminist and denies God’s design for men and women. To the evolutionist he become an evolutionist and denies the first two chapters of Genesis. It goes on an on, but at the end the day the faux contextualizer risks losing the gospel to gain the world. At least he thinks he’s gained the world. Typically, he’s only succeeded at not making the world mad. The world still thinks he’s a joke, but at least the world is not mad at him. He pats himself on the back and says, “Well done, good and faithful contextualizer. Nobody hates you.” But, really, the reason they don’t hate him is because they don’t listen to him. Because the Apostle Paul wrote the go-to proof text for contextualization, I thought it might be wise to note how Paul contextualized. How did he leverage his Jewishness for the salvation of some Jews? How did he leverage his Roman citizenship for the salvation of some Romans? How did Paul save some, and what did it cost him? To the Jews I became as a Jew, in order to win Jews. To those under the law I became as one under the law (though not being myself under the law) that I might win those under the law (1 Corinthians 9:21). He knew he wasn’t one, but he became as one under the law. There is a difference, and he expects us and them to understand the difference. To understand the difference, we can look at his example. He used his cultural credentials to gain access to the synagogues, and then upon gaining access boldly proclaimed the gospel and upset the synagogue. Typically, riots ensued, and some got saved. Consider Damascus. He gained access to the synagogue in Damascus and preached Christ (Acts 9:19–22). The Jews plotted to kill him, and the disciples he won rescued him (Acts 9:23–25). He became as one of them, and as soon as that gave him a platform he told them to believe. He saved some, but a bunch tried to kill him. Something similar happened in Jerusalem. He preached “boldly” and “disputed against the Hellenists.” The Jews tried to kill him, and his disciples rescued him (Acts 9:26–30). In Iconium they tried to stone him (Acts 14). In Lystra they did stone him (Acts 14). In Corinth “they opposed and reviled him” (Acts 18:6), “made a united attack on him,” and “brought him before the tribunal” (Acts 18:12) because, as they said, he was “persuading people to worship God contrary to the law” (Acts 18:13). Yes, contrary to the law. The same Paul who told the Corinthians that he became as one under the law was accused by Corinthian Jews of violating the law. I hope you notice that. He became as one under the law to gain entry, and once he gained entry he attacked their idolatrous notions of the law and pointed them to Christ. So much for a contextualization that doesn’t offend or isn’t clear. So much for a contextualization with the chief aim of winning friends and influencing people. As a Jew for the Jews, Paul used his credibility to gain an audience, preach the Gospel clearly, and save some. Most of the important people tried to kill him. How’s that for contextualization? Paul was Jew to the Jews, so he contextualized by preaching the Bible to those who knew the Bible. To people who don’t know the Bible—like 21st century secularists—things are different. We don’t quote the Bible to them because that’s useless. We just try to be friends and share from experience. That’s what they get. Experience. Not Bible, but personal experience. To which I reply, “Let’s see how the author of your proof text did it.” How did Paul do it with the biblically illiterate? When Paul visited Athens, he visited the intellectual centre of Greek philosophy. Naturally, he conversed with “Epicurean and Stoic philosophers” (Acts 17:18). The philosophers were intrigued “because he was preaching Jesus and the resurrection” (Acts 17:18) so they took him to the Areopagus where “all the Athenians and the foreigners who lived there would spend their time in nothing except telling of hearing something new” (Acts 17:21). The Areopagus sounds a lot like a university, so the university ministries who like talking about contextualization might want to take note of what happened next. He addressed the crowed, pointed to an altar of an unknown god, and then he started quoting the Bible. Yes, that’s right. Paul contextualized to a bunch of Pagan biblically illiterate intellectuals on the 1st century equivalent of a university campus by quoting the Bible. What therefore you worship as unknown, this I proclaim to you. The God who made the world and everything in it, being Lord of heaven and earth, does not live in temples made by man, nor is he served by human hands, as though he needed anything, since he himself gives to all mankind life and breath and everything. And he made from one man every nation of mankind to live on all the face of the earth, having determined allotted periods and the boundaries of their dwelling place, that they should seek God, and perhaps feel their way toward him and find him. Yet he is actually not far from each one of us, for “In him we live and move and have our being”; as even some of your own poets have said, “For we are indeed his offspring” (Acts 17:23–28). I’m not going to list every reference to a Scriptural text (whether quoted directly or implied) in that passage, but there are lots. Those who’d like to know can look in the margins of their favourite reference Bible and the notes of their favourite study Bible. You will not be dismayed. My point is that Paul used the Bible as the authoritative text when he preached to biblically illiterate intellectuals at the Areopagus. Then he told them their worship is false: “Being then God’s offspring, we ought not to think that the divine being is like gold or silver or stone, an image formed by the art and imagination of man” (Acts 17:29). In other words, “Worshiping those idols is rather ignorant of you sophisticates. If God made you, you should stop worshiping things that you made. How silly.” Granted, he didn’t say “ignorant,” at least in verse 29 he didn’t. But in verse 30 he did use its adjectival derivative: “times of ignorance.” Paul, to the self-perceived intellectual elites of Athens, said they exist in times of ignorance. They don’t know things. They are void of true knowledge. So they should stop thinking they know things, and realize they’re ignorant. It’s time to stop the ignorance. But he goes further. He doesn’t stop at calling out their ignorance. He warns that if they don’t repent, Jesus will judge them on the day of judgment (Acts 17:31). How do we know that to be true, Paul? It’s true because Christ rose from the dead (Acts 17:31). So what is required of the intellectual effetes? That they repent (Acts 17:30). How’s that for contextualzation? People reacted. “Some mocked,” “others said, ‘We will hear you again about this,’” and “some men joined him and believed” (Acts 17:32-34). That’s Pauline contextualization. To be clear I think contextualization is needed. But I think bringing context to biblically based contextualization is needed more. 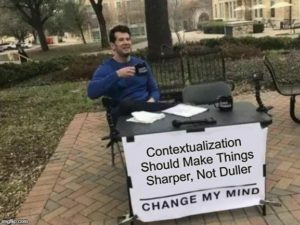 Much of what’s called “contextualization” is blubbering, gibberish, prattling, babbling, drivel, twaddle, idle talk, and mumbling. So, I’ve gone to Paul who wrote every contextualizer’s favourite proof text, and I’ve explained what he did. He gained entry into crowded places. He preached the biblical message clearly. He called people to repent. He made enemies, and he saved some. That is not what passes for contextualization in many places. 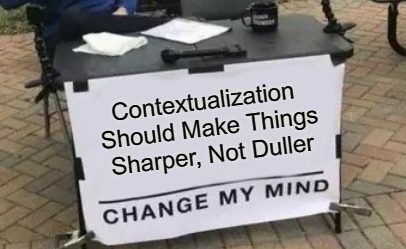 Instead of making the gospel clearer, many never preach it and call it “contextualization.” Frankly, contextualization is often code for cowardice.